You have probably heard from a friend that he swapped out or replaced the rubber bushings with poly (polyurethane) bushings, and that it improved the suspension or steering system response and feel in his vehicle. There are any number of automotive aftermarket performance companies that offer poly bushings for their products such as shock absorbers; spring shackles or spring eyes; anti-sway, radius, and track bars; and transmission, engine or body mounts. Polyurethane seems to be everywhere in the automotive enthusiast marketplace. So what’s so great about poly? To answer that question we went to an industry leader to get the skinny on aftermarket poly bushings and mounts. Energy Suspension has been producing poly products for the automotive performance aftermarket since 1983. Since then, Energy Suspension has been continually working to improve and perfect the base material of its polyurethane (referred to as Hyper-Flex by the company), and engineer new applications for cars and trucks to benefit automotive enthusiasts. 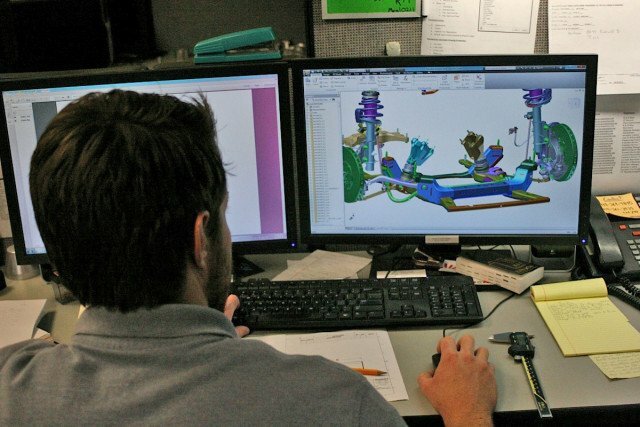 Once a specific vehicle or application has been checked out in the Energy Suspension R&D department, and the engineering team has made its initial assessments, CAD systems are used to design the polyurethane parts. A durometer is an instrument used to describe the hardness of the poly. To be more precise, it provides a measurement of the depth of an indentation in the material created by a given force. This depth is dependent on the hardness of the material, its viscoelastic properties (the viscous and elastic characteristics when undergoing deformation), and the duration of the test. The durometer test that Energy Suspension uses measures the initial hardness of the poly product. The basic test applies force in a consistent manner, without shock, providing a comparative number of the hardness (depth of the indentation) of a bushing or mass of poly material being designed for a certain application. Different products require bushings with different durometer readings (hardness and viscoelastic characteristics) to properly perform their intended function. The ideal durometer reading or number for an anti-sway bar bushing is not the same for a transmission mount. 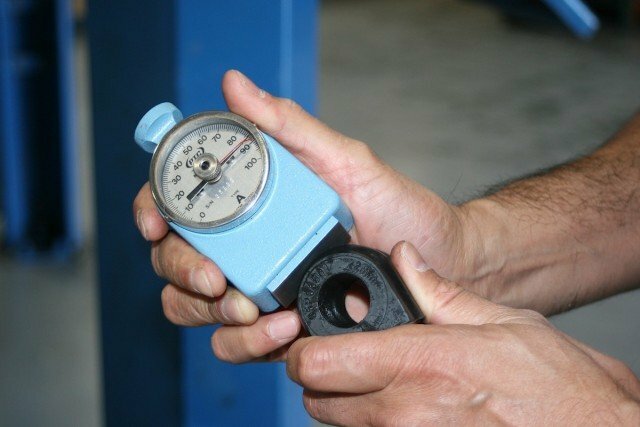 A durometer gauge is used to check prototype parts during the engineering process to make sure the material has the proper hardness for the job intended. The piece of equipment the poly bushing or mount is supporting will have less deflection. In the case of a suspension component such as a shock absorber, instead of the rubber bushing compressing and allowing the jounce, rebound, and vibration to be transferred to the vehicle (and the passengers), according to Energy Suspension, the poly-equipped shock absorber is more precisely and securely held in place, allowing it to perform at its maximum efficiency, and do the job it was intended to do. A poly transmission mount will resist compression better than rubber, thereby diminishing deflection of the transmission during hard corning or acceleration/deceleration. A part-master is created from which the mold for the production polyurethane parts will be made. Once that is accomplished, the vehicle is put up on the lift to begin tearing it down, and taking measurements. The engineers at Energy Suspension use their knowledge concerning what it needs, why the OE did what it did, and how they can improve on it. A design is created using CAD systems, and then a an aluminum part-master is made based on that design. Energy then creates a mold for production parts based on that aluminum. Once a mold is made, molten poly is poured into the mold to make the first sample part. The sample part is installed on the vehicle, and during that process, the engineers are taking notes and examining how the part fits, where the part might need a little extra length here, or a little less there. With their experience working with cars and developing poly bushings for so many different applications, the Energy Suspension engineering team can often see if a part is going to work before the first test-drive. An Energy Suspension engine mount is seen here, the two separate parts placed together to show positioning (left), and then bonded together by the polyurethane (right) after being pulled from the mold. Energy Suspension also has a driver feedback form. The vehicle owner is asked to rate items such as the vehicle’s comfort level on a scale of one to 10 with all the OE components on the car first. Then the vehicle owner rates on a scale of one to 10 how the ride, handling, steering response, etc., has improved, now that the Energy Suspension poly parts are installed on the vehicle. This comparison helps engineers because the owner has been driving the vehicle every day and may pick up on things that the engineers didn’t notice. After the molten polyurethane has hardened and the rough parts are removed from their molds, they are trimmed to exact specifications. Energy Suspension also stays in touch with the driver and occasionally brings the test vehicle back in after a while, maybe 500 miles later. They take a look underneath the car to make sure everything has remained correctly seated. If the vehicle is driving great with no issues, then the release process begins in which all sample parts are finalized, and the product is approved to become a full kit. The multitude of polyurethane products that Energy Suspension makes for hundreds of applications include everything from shock bushings (left) to A-arm pivot, steering knuckle, and anti-sway bar end link bushings (lower right). In order to keep a poly bushing where it is supposed to be and performing how it should, the bushing and its bracket are designed to create a pre-load on the bushing once properly installed. That way it’s going to stay in its location, not move around and get sloppy, and have increased longevity as the suspension cycles. Greasing poly bushings is also recommended. As we found out by talking to the experts at Energy Suspension, there are a number of reasons why its poly bushing and mount products are far better than the rubber counterparts. Poly delivers greater resilience to the forces placed on it than rubber, and will not go mushy like rubber under the pressures of everyday driving or performance motoring. Polyurethane does not rot, soften, or deteriorate from exposure to caustics and petroleum products. – Santa Cruz. Energy Suspension’s poly products are long lasting, as they are not adversely affected by exposure to oil, fuel, salt, UV rays from sunlight exposure, or chemicals that may drip down on them from the vehicle. Each and every poly product is specifically designed and formulated to improve the performance of the OE part it replaces, whether it be a shock or spring bushing, A-arm bushing, or an engine or transmission mount. “All polyurethane is not created equal,” Santa Cruz said. Indeed, some new formulas are being worked on right now. One of the projects on the horizon is a polyurethane blend that has a much higher heat tolerance than the current line of products. This would allow the company to produce bushings, hangers, and mounts for automotive parts that are in close proximity to heat sources, or components that produce, transfer, or flow heat. Always moving forward with new technology and products, Energy Suspension is currently working on a high-temperature tolerant polyurethane formula that can be used adjacent to or on heat-producing components, as well as items such as these polyurethane Jeep engine hood latches to replace the rubber OE units. Energy Suspension is occasionally called upon to create custom bushings, aside from the nearly 3,500 part numbers it already produces. Simply because you don’t see a bushing in its catalog specifically for your vehicle, or you are doing some custom fab work, doesn’t mean that the company doesn’t have a bushing that will work for that vehicle or location you’re designing. For instance, if a customer comes in with a control arm and gives the engineers all the eyelet sizes and dimensions, and exactly what the end use is, they can work to design just the right bushing. “These custom projects are rare cases, but considering all of the different types of customers we work with, we must make bushings for everything from autocross to off-road racing. When you add up all of these disciplines, it’s quite a bit of business, and the company tries to help out where it can with special applications.” Spaeth continued, “It is nice to have these challenges so we know what our bushings can handle.” If you’re looking for more information about how and why polyurethane products can improve the ride and handling of your vehicle, check out the Energy Suspension website or call (888) 913-6374. A car sits up on the rack being gone over by the Energy Suspension R&D department.